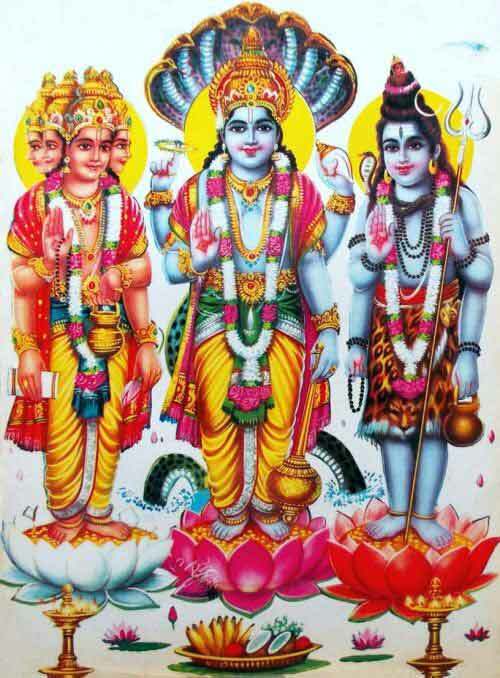 In Hinduism, Trimurti is the symbolic representation of Brahman in three separate divine powers - Brahma, Vishnu and Shiva. The three divine powers or cosmic functions are creation – sustenance – transformation (wrongly understood as destruction). The iconographical representation (sculpture) of Trimurti can be traced back to the early Gupta period. The idea is also mentioned in the Maitri Upanishad. Brahma, Vishnu and Shiva are not independent gods. But they are the threefold manifestation of the Supreme Truth. The concept was developed to make people realize the concept of Supreme Truth and its cosmic functions. Trimurti concept should also be understood in terms of gunas or qualities - Sattva, Rajas and Tamas. The entire universe is in a continuous play of the three gunas. The three cosmic functions and the three gunas are correlated. Some scholars are of the view that the concept of the three gods was a clever attempt to get the various warring sects under one umbrella. But the concept never became popular. Individual deities were widely worshipped than the Trimurti. This is because in Hinduism each individual has the freedom to know the Supreme Truth in the best way he/she prefers. This individual freedom to know the God negates such forced amalgamation. Please note here that Shiva himself has a Trimurti form known as Mahesha Murti. This is found in the famous Elephanta caves near Mumbai, India. Bhagavan Dattatreya is a combined form of Brahma, Vishnu and Shiva.